We are very excited to have become fast friends with another simian podcast. Not apes, chimpanzees or orangutans, but Monkees! On our last episode we learned of the many connections between the Planet of the Apes TV series and The Monkees TV series, and we learned this from Zilch: A Monkees Podcast. 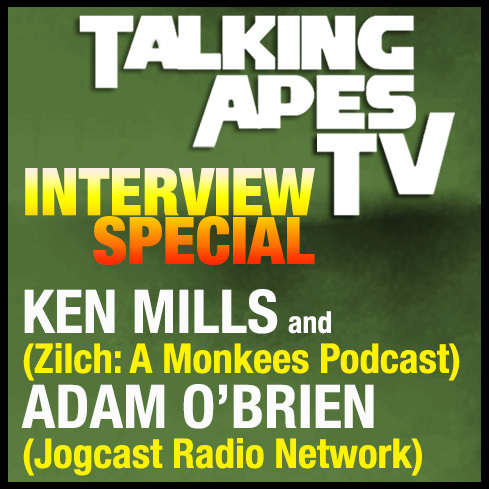 Creator and host, Ken Mills, will be joining us to talk childhood Ape stories, his passion for The Monkees and his KISS and Cheap Trick podcasts. What’s an Ape connection without a new jingle? We have 2 great new Monkees/Apes jingles written by podcast composer Rob Dehlinger. If you thought ‘Yabba Dabba Urko’ was catchy ring-tone wait until you hear these!